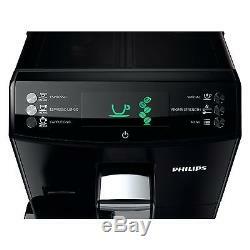 Philips HD8834 / 01 automatic Cappuccino Espresso coffee maker black. Frothed milk drinks at your fingertips. Automatic rinsing and cleaning programs. 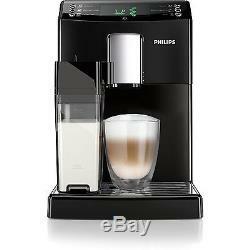 Philips HD8834 / 01 coffee machine with integrated. Espresso from freshly ground beans at your fingertips. Creamy cappuccino at your fingertips with the integrated milk container. Great taste thanks grinder, 100% ceramic. Individual grinding settings for your preferred taste. Personalized your coffee with the coffee strength selection. Easy operation via the intuitive display. Fits your cup thanks to the adjustable coffee spout. Undisturbed enjoyment: high capacity in a compact design. Easy cleaning thanks to completely removable brewing unit. Automatic cleaning and descaling cycle. You get a perfectly prepared espresso from freshly ground beans, or two at a time, by pressing a button with a waiting period of a few seconds directly into the cup. Enjoy super-creamy cappuccino with perfect temperature - in an incredibly simple way. Simply pour milk into the container, insert it into the machine, and select your preferred beverage. Whether cappuccino or milk foam, in just a few seconds you'll get your drink - milk spout without spraying at an ideal temperature. Say goodbye to the taste burned coffee grinder with our 100% ceramic which has been developed so that the beans do not overheat. The ceramic material ensures a long-lasting performance and quiet operation. You can adjust the granularity of the grinder 5 different settings. Select the finest grinding for a full-bodied espresso through to the coarsest for a lighter coffee, depending on your preferred taste. You will receive thanks to the Brühdauer-, Kaffeestärken- and temperature selection always a perfect cup of coffee, which was prepared according to your preferences. You can also save the memo function, the quantity determined for each beverage. 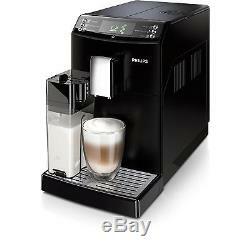 Enjoy a delicious coffee beverage in your favorite mug simply pressing a button. The intuitive display shows all relevant information for easy interaction with your machine and optimum performance. 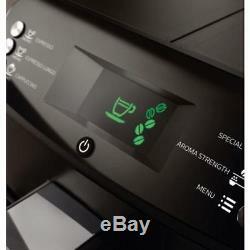 The buttons on the front can offer a wide range of drinks at a keystroke. Whatever the size of your favorite glass or cup of your favorite can of coffee dispenser with only one hand to adjust, so that all the flavors are retained and your coffee at the right temperature reserves, directly into your cup. 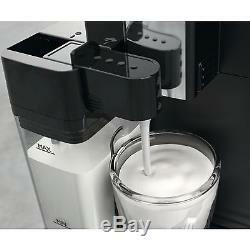 In the highest position of the spout can even fill 15-cm-latte macchiato glasses. Enjoy the benefits of more space and less refilling thanks to large beans, water and coffee grounds container in a compact design. This intelligent, fully automatic machine offers maximum comfort, excellent performance and a large capacity (water tank with 1.8 liters, milk container with 0.5 l Bean container for 250 g and a grounds container for up to 15 portions). 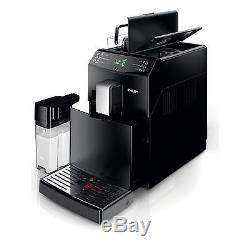 The brewing unit is the heart of every fully automatic coffee machine and it should be cleaned once a week. Our brewing unit is easily accessible from the side and can be removed with just one movement and cleaned under running water. This appliance is designed for an automatic cleaning coffee circuit with water when you start or off - for great, fresh taste with every cup of coffee. Regular descaling prolongs the life of your espresso machine. This machine not only reports when they need to be decalcified, but guides you if necessary with clear instructions on screen by the automatic descaling. Some items might come with a default language in German you will have to go in the menu and select the language you need or change on start-up. Electric items come with 2 round pin Europe style plugs, we will include an adapter depending on the destination country. Counties with strict custom rules and regulations like: Russia, Vietnam, Ukraine, Kazakhstan, Brazil, Chile, Uruguay, Israel, etc, may take longer due to strict custom rules and regulations, not couriers delay. We cannot calculate this cost for you in advance. Most countries just add VAT on the declared value of the package. The rules are different in every country. Unfortunately we cannot know the rules, regulations or practices for each country. Please check the package before receiving the item. Items that are sent back should be sent with original packing and all accessories included in the package received. We try to maintain high standards of excellence. Eedback is very important to us. We cannot resolve any issue, if we do not know about it! We are always here and want to keep our customers satisfied, we will solve any issue that might occur. Please have a look at our. The item "Philips HD8834 / 01 automatic Cappuccino Espresso coffee maker black" is in sale since Thursday, November 16, 2017.